The Vinolet Wine & Glass Rack is a unique wall mounted rack that makes a great show-piece when mounted in a kitchen, dining room or any other area of the home where guests can admire the best of your collection. 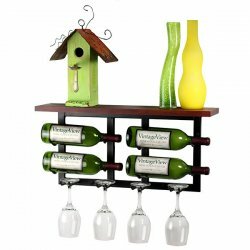 Showcase 4 of your finest bottles of wine and 4 stemmed wine glasses with this decorative display rack. Shelf allows for additional space to display wine accessories or other fun knick-knacks. Price reduction in effect as the Prototype model is being cleared.